This film is based on Stanley J. Weyman’s 1894 novel, the most popular book by that now-forgotten English historical adventure author, a man whose work was greatly admired by his contemporaries Robert Louis Stevenson and Arthur Conan Doyle (and by this editor—I included one of his short stories in my anthology The Big Book of Swashbuckling Adventure). 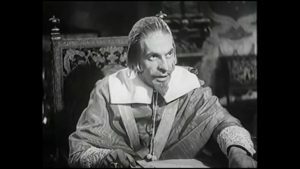 The Red Robe refers to the ecclesiastical raiment of Cardinal Richelieu, portrayed here by the dour and domineering Raymond Massey, who was a perfect choice for the role. But his is actually a minor part: the hero is a veteran swashbuckler named Gil de Berault, played by the German actor Conrad Veidt, whom we all know best as Major Strasser from Casablanca. Seeing beyond Strasser to accept Veidt as a French cavalier takes some effort, but after a while you get used to the idea. (You’ll still laugh at his black page-boy hair, however.) Berault is a notorious duelist nicknamed “The Black Death” who performs occasional missions for the cardinal. Returning from one such mission, Richelieu informs him of the new edicts that forbid dueling, and warns Berault that if he breaks them, he’ll hang. Richelieu then orders some arrests, and plays his flute for a while to relax. Meanwhile Berault takes his pay to a gambling hell where he’s accused of cheating, challenges his accuser to a duel, runs him through, and is promptly arrested by the Cardinal’s Guard. He’s condemned, but on the way to the scaffold he’s reprieved by Richelieu, who suspends his sentence on condition that he accomplish an impossible task: infiltrate the castle of a rebellious southern duke and bring him back a captive to Paris. The cardinal gives Berault an assistant—and watch-dog—named Marius, an engaging rogue with nimble fingers who’s adept at sleight-of-hand. Cut almost immediately to the south of France—no time is wasted in this film—and the grim and gothic Castle Foix. Berault, reluctantly rescued from drowning in the adjacent river, is taken into the castle, where everyone is suspicious and unfriendly. How to gain their trust? By the traditional method, of course: romance the lady of the castle! Enter Mademoiselle de Foix, played by French actress Annabella (yes, she has just one name, like Cher). Berault the spy inevitably falls for her, though she’s the sister of the man he plans to betray. This sort of thing usually gives a plot focus, but instead the middle of the movie grows confused, with everyone wearing false names, while agents with McGuffins mysteriously come and go, and character motivations get murky and unclear. It doesn’t help that there’s zero chemistry between Veidt and Annabella, which drains all credibility from their romance. Oh, there are secret passages, a tower climb, pursuits and escapes, and noble renunciations in the name of honor, but they can’t quite save the thing once it’s gone smash. The ending, when the cardinal comes back on stage, is better, but it can’t make up for the muddled middle. Too bad: Massey is awfully good as Richelieu.